I'm trying to remember what's happened since I last updated. Not much...that I can remember anyway! I found two more lumps (one in each armpit) last week, I went to get them checked on Monday and they'd gone, just like last time. Haha. Typical. I also found another lump in my belly on Friday morning and when I went to the Hospital to get my PEG I mentioned it to the Nurse and she said it was probably from my clexane injections. And today I can't feel it anyway, I hope I don't get anymore because I always panic when I find them, lol. I'm trying to think what else has been going on, oh - me and Pete went to BBC Essex radio station last Friday and we had a really nice time. Obviously, I didn't speak but Pete did really well and answered all the questions right! Apparently Pete had another phonecall from someone else there to do another interview. Don't know much else about it though! I was also interviewed by another newspaper, Braintree and Witham Times. That came out on Wednesday, I was pleased with that as well as all the others. I do sometimes get worried that it'll get turned in to a depressing story and they'll get things wrong but so far, so good! I had my final mask fitting on Friday, went fine. I had a hot flush while the mask was on lol. It was so frustrating cos I really wanted to fan my face but I couldn't! I start radiotherapy tomorrow, I'm not nervous about it or anything because I know it will be alright. My appointment is at 3:10pm. I thought I had chemotherapy tomorrow too but it's on Wednesday. Lastly, I'm just wondering if all my readers could do me a favour. I get quite a few hits on my blog each day but don't get very many comments. I'm just interested to know who does actually read my blog and where they live - so if you read this please could you leave a comment saying where you live or just say "Hi" or something. If you don't know how to comment me then you can always email me at hayleydyer3@googlemail.com - Thank you! Well, I think by now you know my name is Jacqui and I live in London! Though home is Scotland, so I'm kind of all over the place lol. I hope you get lots of comments telling you where people are from, it'll be really interesting to read! I'm actually just sat here writing your letter ready to post in the morning :o) I like writing to you, it's fun, I hope you like my little letters. Writing is a dying art! Anyway my dear good luck with the radiotherapy...It's all set, and once it's started then that little buggar will get shrinking even more, which is fabulous :D I will be thinking about you when you're having your treatment, and wishing you well. Hello, my name is Suzi and i live in spain.unfortunatly ;). but you know i'm all english. hah. I came to you through Cheryl Johnsons Blog. I come from Northants. My friends 7 year old fought cancer so I know what an impact it has, your upbeat approach is fantastic. I am a bit shocked by you being a fan of spice girls though LOL. I was East17 fan so can't comment!! LOL. 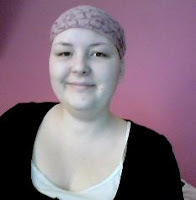 Keep blogging and most importantly Keep Kicking Cancers Arse girl. Well done for coping like you have done with your PEG tube. You're a brave soldier-ess! Glad the pain isn't as bad as it was. Well, as always sweetheart, I am walking alongside you, counting the days till this cancer's arse has been well and truly kicked! I first came across your blog through Cheryl Johnson too. I visit to keep up to date on what you're doing to that nasty 'c' word!! LOL. My name is Rosie and I live in Northants. I try and leave you a comment of support every time you leave a post. My name is Dave and I'm an alcoholic. Whoops sorry wrong place and you already knew that, haha. I'm your aunties boyfriend and I live in Grays, Essex! Really nice to see you the weekend and sorry you couldn't come shopping on sunday with me. Shame, you missed out on a good topman bargain....I got a tshirt for...guess how much?? £1!! Do you want a lollipop...maaaaann? Couldn't believe how horrific the PEG fitting was and think you are incredibly brave, much braver than I would have been in the situation - so well done for that. Let's hope you don't have to use it and you will be ok with your throat but better to know its there in case. Hope things today went ok for you, waiting for Pete to get in from work to hear about it all, although he foned me at work to say you are in the paper yet again! I still need that autograph! Anyway I will let you get on. Be thinking of you both this week, especially on Wednesday Hay. belly. I can't imagine what it must feel like. I hope that the pain lets up though. I definitely try to comment every time i read. I know when you're feeling sick, or down, or even when you write a blog, it's nice to get at least a "hi" or a smiley comment to make you feel better. Especially since it's such a personal/emotional thing to have to go through. I don't know if you knew where I was from though, but I'm from Australia. :) Well, not FROM there, I'm from the USA but i'm living over here. Anyway, good luck this week, darlin! I hope everything goes well and that you're not in TOO much pain! Just popping in to see how things are going with you lately!! Sounds like your coping well, your very brave!! Keep your chin up, always here for you! Hi my name is Hayley as well - what a cool name we have! I live in Wethersfield in Essex, and I started reading your blog after seeing your interview in the B&W Times. I totally admire your positivity - my problems seem pathetic compared to what you face on a daily basis! Keep your spirits up - you've got plenty of people keeping their fingers crossed for you! Hi, my name is Christine...I read your blog, you are a very courageous young lady! I got your blog info from your mom on OCF website....Im from Pennsylvania in the US. Hi Haley! My name is also christine (d) and I too am from the OCF website. I live in NYC and I wanted to check in to see if the PEG situation improved at all for you. Remember the PEG soreness will definitely go away. You are very brave. Today was my 11 RAD treatment and so far so good for me. Please PM me on the OCF website if you want to chat about anything. You'll find me under christine d.
You are a brave funny person and have a great spirit. keep on kicking!